In January, 2018, I was surprised - and thrilled - to receive an email from a woman at the World Trade Organization in Geneva, Switzerland asking if she and her colleagues could do their own recording of “One Woman,” the anthem I co-wrote for UN Women. Front row, left to right: Cyril Cottereau (voice), Ninez Piezas-Jerbi (voice), Sroda Bedarida (voice),Helen Favez (voice), Sheila Coyle (voice). Back row, left to right: Steve Tanner (electric guitar), Majda Petschen (flute), Hannu Wager (bass guitar). And a little more than one year later, they did it. Recorded their own instrumental tracks, vocal tracks, produced a video - the whole shebang. And shared it, in-house, on International Women’s Day. I asked her Ninez Piezas-Jerbi about the “making of” their song. By day, Ninez is a Senior Statistician, WTO Gender Network advocate, and the WTO Employee Networks coordinator. By night and weekend, she made “One Woman” come to life. We both hope this will inspire others to create their song so they can feel the joy and power when we sing together. Beth Blatt (founder Hope Sings): Where did you get the idea to do your own in-house recording on “One Woman”? Ninez: I got the idea during our preparation for International Women’s Day 2018. After listening to the song again, I said to myself, “Why not see if our in-house musicians could do this, too?” If we could pull it off, perhaps other international organizations could do the same!” We had an amateur rock band at the WTO and a makeshift recording studio as well. We could rehearse there and see if there was money to buy us a few hours to record the song in a proper studio. For a long time now, I had been trying to find a way for us, WTO staff, to do something symbolic for Women’s Day and in our own unique way. With our love for music at the WTO, this was how we could do it. So that’s what we did. With the money entrusted to me as volunteer WTO Employee Networks coordinator, I bought 3-hours of recording time one Saturday afternoon in April 2018 in the cheapest recording studio we could find in Geneva. We had a few volunteer musicians: 2 guitarists, a drummer, 3 female and 1 male vocalist - all of us sacrificing our weekend to do this song. 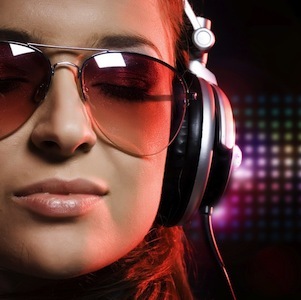 Lucky for us, too, our male vocalist did sound engineering as a hobby. He had just been hired by the WTO on a short-term contract. Given our limited funds, we were so happy we could use him to help us edit our recording. Beth: What it was like in the studio to sing and edit? How did you feel before and after? Ninez: It was an experience to sing in a recording studio! The special microphones for vocalists especially amplified our voices, we sounded like real recording artists! It felt awesome! As for the editing, given our work schedules, this was the difficult part. It took a while for us to figure out how to make our sound better. Some parts were not in the right tempo, some were out of tune and some needed more volume. Our volunteer sound engineer colleague had a lot of editing to do! Moreover, his short-term contract ran out that he had to leave the WTO and Geneva! After corresponding by email, though, he finally got the sound track finished in December 2018. It was such a great Christmas gift to hear the final version! My next problem was getting the video done. We didn’t have the money to get a proper videographer, so I had to do it myself. I’m not a particularly great video editor, but I manage. I had to learn, however, a new video editing software. In the end, it took me 4 weekends to get it done, just in time for Women’s Day 2019! It was really a labor of love because the video was the only way I could show off the hard work my colleagues and I put into the recording. It’s not an official video of our organization, but just a symbolic gesture of support from some of the people who work there. Beth: What a labor of love! Are you glad you went through it? Ninez: What a rewarding experience it was! For us colleagues who don’t normally work together, it was a great bonding experience and opportunity to use our love for music and do something meaningful together. 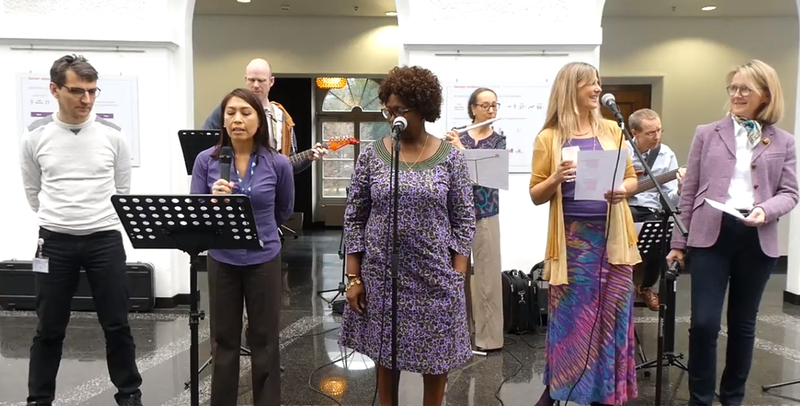 To highlight the end of our WTO International Women’s Day 2019 celebration, we were asked to sing the song live in our Atrium. As we were singing, I really felt the support of colleaguesfor the hard work we had done to create this positive moment. They all knew we were amateur musicians who only came together to sing this one song. They especially got out of their offices to listen to us and give a supportive applause. It was so touching! It created such a positive moment for us all, especially when many joined in singing that last “Shine, Shine, Shine”! From left to right: Ninez Piezas-Jerbi (voice), Steve Tanner (electric guitar), Majda Petschen (flute), Beatriz Alvarez Castillo (voice), Isabel Calderon (voice), Hannu Wager (bass and acoustic guitars), Lilo Prizzi (percussion), and Kivanc Inal (voice, sound).